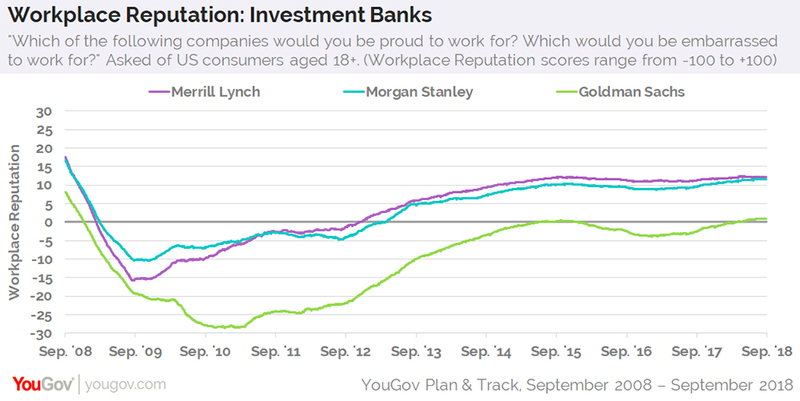 By contrast, Reputation scores for competitors Merrill Lynch and Morgan Stanley never dropped to such lows. Both also returned to positive territory near the beginning of 2013, where they’ve remained ever since. At present, Merrill Lynch and Morgan Stanley each have a Reputation score of 12. Goldman Sachs has a Reputation score of 1. People who say they’d be proud to work for Goldman Sachs are most likely to be male and to fall between the ages of 50 and 64. They're more likely to live in a suburb — as opposed to city, town, or rural area — and have attained a high school education, rather than a four-year college degree. Two-thirds (67%) of people open to employment at Goldman Sachs report that they tend to trust banks and credit unions, compared to 54% of the general public. Furthermore, the majority (54%) of people who'd be proud to work for Goldman Sachs say they prefer to have more than one bank account. Fewer than half (47%) of all US adults indicate the same. While Goldman Sachs’ overall Reputation score has returned to the positives, one group that still places the investment bank in the negatives is liberals. 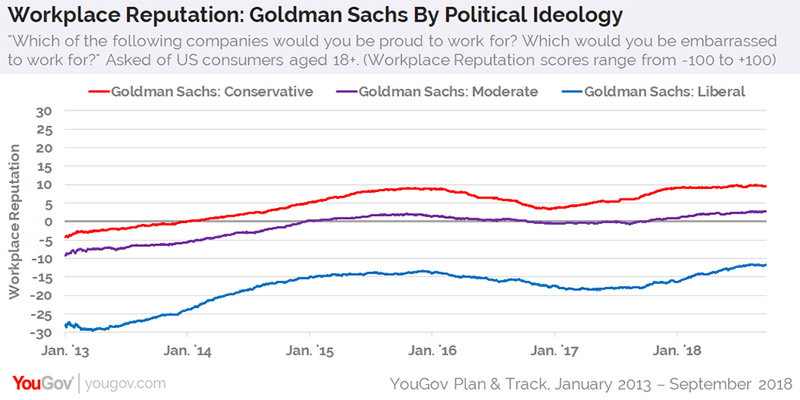 Looking back to January 2013, when YouGov began tracking people by political ideology, Goldman Sachs had a Reputation score of -28 among consumers who lean left. Conservatives, meanwhile, gave the firm a score of -4. As they tend to do, moderates placed themselves in-between, with a Reputation score of -9. As of today, the bank’s Reputation score has climbed to -12 among liberals, 3 among moderates, and 10 among conservatives.